Rajasthan Royals mentor Shane Warne lambasted Kings XI skipper Ravichandran Ashwin for 'Mankading' English international Jos Buttler during their match in Jaipur. 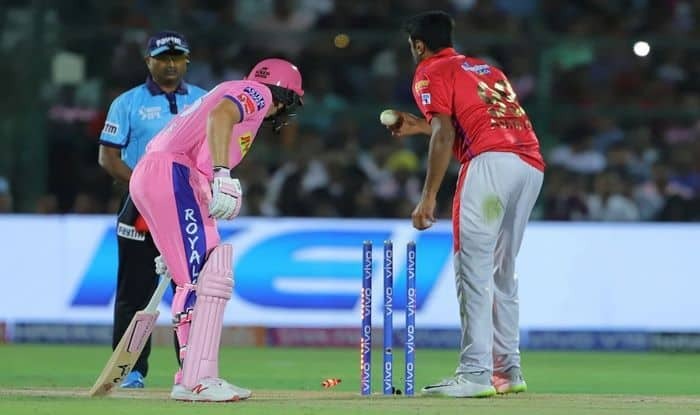 Rajasthan Royals mentor Shane Warne lambasted Kings XI skipper Ravichandran Ashwin for ‘Mankading’ English international Jos Buttler at their opening match of Indian Premier League’s (IPL) 2019 campaign at the Sawai Mansingh Stadium in Jaipur. The former Australian cricketer took to his social media to express his anguish over the incident. The dismissal, which is widely known as ‘Mankading’ — when a bowler runs out a non-striker before delivery — is considered to be against the spirit of the game. Jos Buttler became the first victim of ‘Mankading’ in the history of the cash-rich IPL when a desperate Ashwin, dismissed the batsman in a controversial manner. As expected Buttler seemed furious and had a heated exchange with Ashwin before leaving the field. Rajasthan were 108 for one in 12.4 overs at that stage. The dismissal was within the rules of the game but sparked a huge controversy and was considered against the spirit of the game as the off-spinner should have given the Englishman a prior warning. Warne was among several who reacted in the aftermath of the incident which led to outrage on social media: “So disappointed in Ravi Ashwin as a captain and as a person,” Warne wrote. “All captains sign the IPL wall and agree to play in the spirit of the game. (Ashwin) had no intention of delivering the ball — so it should have been called a dead ball. Over to you BCCI — this a not a good look for the IPL. “Ashwin’s actions were simply disgraceful and I hope the BCCI doesn’t condone this sort of behaviour in the IPL. “As captain of your side you set the standard of the way the team wants to play and what the team stands for! Why do such a disgraceful and low act like that tonight? You must live with yourself and FYI — it’s to late to say sorry Mr Ashwin. You will be remembered for that low act. “Any player in the game that does that to anyone is an embarrassment to the game and as captain it’s even more disgraceful,” he wrote.